This is what happens when you riddle a cop car with bullets. It’s not every day someone gets so angry they decide to take their fight with the police straight to the police, but people from Texas are a different breed, more than willing to roll up to the cop shop, Assault At Precinct 13 style, and take the fight right to the police. 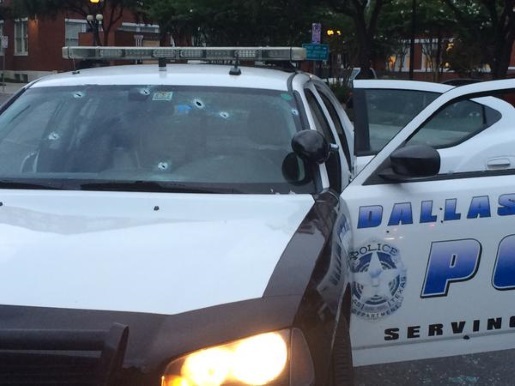 That’s just what happened early Saturday morning in Dallas, Texas. Up to four men in an armored van attacked the Dallas Police Department’s headquarters, pumping bullets into windows and vehicles and leaving behind four or more bags of pipe bombs. One of those bags of bombs blew up when the bomb squad robot attempted to move it; the robot remains on duty despite his injuries. This situation is far from over. Though police were able to disable the armored van with a .50 caliber rifle, the van made it to a fast food restaurant where the armed attack has morphed into an armed stand off, with SWAT negotiating with a man who calls himself James Boulware. That name has been linked to a history of domestic violence; and the man claiming to be Boulware says that police are responsible for taking away his child and labeling him a terrorist. Given his planning and obvious armed nature, I hope the cops keep their helicopters out of firing distance. Meanwhile, bomb-sniffing dogs and bomb disposal robots continue to search for more surprise bags of pipe bombs courtesy of Boulware and his accomplices. For information as it happens, I recommend following the Dallas PD Twitter feed, because it’s been great.